EURUSD is going to be volatile today due to various economic reports being published in Eurozone and the US. Traders are looking at German CPI & Employment Data. 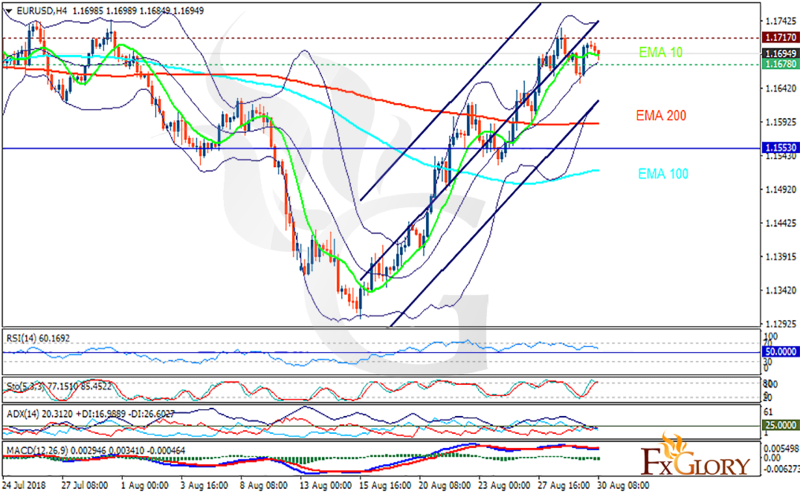 The support rests at 1.16780 with resistance at 1.17170 which both lines are above the weekly pivot point at 1.15530. The EMA of 10 is moving horizontally in the ascendant channel and it is above EMA of 200 and the EMA of 100. The RSI is falling towards the 50 level, the Stochastic is moving in high ranges and the MACD line is below the signal line in the negative territory. The ADX is showing sell signal. The resistance level breakout will push the price up towards 1.18, otherwise, EURUSD will fall towards the lower Bollinger band at 1.15.